The 2017/18 season saw DairyNZ investing the dairy farmer levy to continue the research, innovation and projects which help support the industry into the future. In 2017/18, $66.2 million was collected through the milksolids levy, plus DairyNZ received government co-funding. That money is invested into a wide range of programmes, guided by the sector strategy. 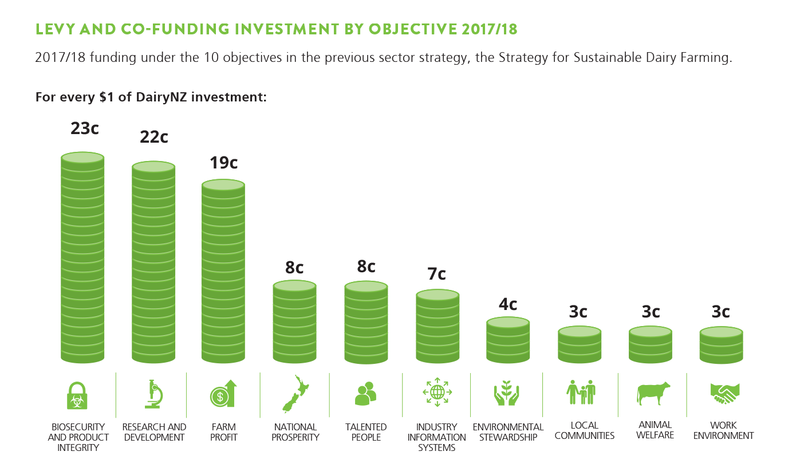 DairyNZ work covers research and development to create practical on-farm tools, leading on-farm adoption of good practice farming, promoting careers in dairying and advocating for farmers with central and regional government. Read about DairyNZ’s project highlights for 2017/18. To see key projects for 2018/19 click here. To read the full version of the Strategy Scorecard click here. DairyNZ’s Annual General Meeting (AGM) was held in Invercargill on 31 October 2018. Two new directors were welcomed to the Board. We have a governing board of eight members. Five are farmer-elected and three are independent, professional directors. The DairyNZ Board is supported by a leadership team led by chief executive Dr Tim Mackle. View biographies for the team here.